Gacko (Serbian: Гацко) is a town and municipality located in Republika Srpska, an entity of Bosnia and Herzegovina. It is situated in the region of East Herzegovina. As of 2013, the town has a population of 5,784 inhabitants, while the municipality has 8,990 inhabitants. 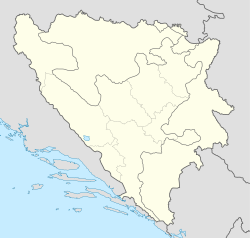 The municipality covers an area of 736 km2 (284 sq mi), making it one of the larger municipalities in Bosnia and Herzegovina. The town is near the state border with Montenegro. In the 14th century the region was governed by the powerful Vojinović family. In 1359, veliki čelnik Dimitrije held the region. The rebels were defeated at the field of Gacko. It ultimately failed due to lack of foreign support. Austro-Hungarian authorities took it over in 1878, a decision which was made at the Berlin Congress. In 1908, Austria-Hungary annexed Bosnia and Herzegovina sparking the Bosnian crisis which eventually led to World War I. After that war, Gacko joined the State of Serbs, Croats and Slovenes, going on to the Kingdom of Serbs, Croats and Slovenes by the end of 1918. These were the first incarnations of Yugoslavia where Gacko remained until Bosnia and Herzegovina declared independence in 1992. According to the 2013 census results, the municipality of Gacko has 8,990 inhabitants. The Gacko coal mine and thermoelectric powerplant is located the municipality, and is also the largest employer in the area. The local football club, FK Mladost Gacko, plays in the First League of the Republika Srpska. ^ Fine, John Van Antwerp, Jr. (1994). The Late Medieval Balkans: A Critical Survey from the Late Twelfth Century to the Ottoman Conquest. University of Michigan Press. p. 53. ISBN 978-0-472-08260-5. ^ SANU (1908). Glas. 78–80. SANU. p. 196. ^ Ćorović, Vladimir (2001) . "Преокрет у држању Срба". Историја српског народа (in Serbian). Belgrade: Јанус. ^ "Popis 2013 - Gacko". statistika.ba. Retrieved 29 December 2018. ^ "Cities and Municipalities of Republika Srpska 2017" (PDF). rzs.rs.ba (in Serbian). December 2017. Retrieved 21 October 2018. HadžiMuhamedović, Safet (2018) Waiting for Elijah: Time and Encounter in a Bosnian Landscape. New York and Oxford: Berghahn Books. Wikimedia Commons has media related to Gacko. This page was last edited on 15 March 2019, at 12:01 (UTC).